College Students: What Does Israel Mean To You? College students: You are invited to participate in a community art project called “Israel Means to Me.” To participate, all you have to do is mail us a 4″ x 6″ postcard expressing what Israel means to you. All the entries will be posted here on our campus blog. This art project is an opportunity for Israel’s supporters and their peers on campus to share their feelings about Israel in a safe and creative space. No entry is a wrong entry. We look forward to seeing your ideas and feelings toward Israel in this new project. 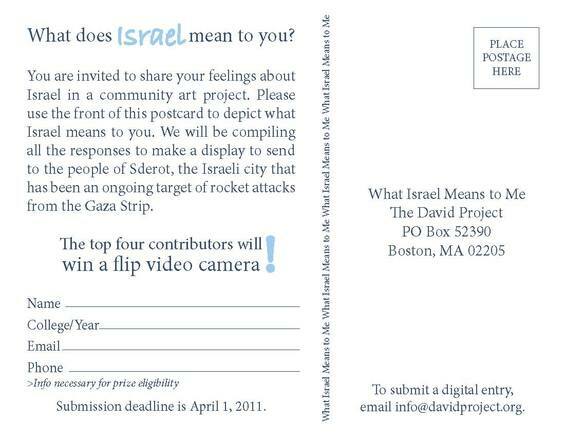 Submissions will be accepted from January 1-April 1, 2011, and the top four contributors will win a Flip Video camera from The David Project. The winners will be announced in April after all entries have been submitted and The David Project community has had time to review them. Notice: By submitting your artwork, you grant The David Project the right to use your work on our website, in exhibitions in North America or in Israel, as well for use in other media.